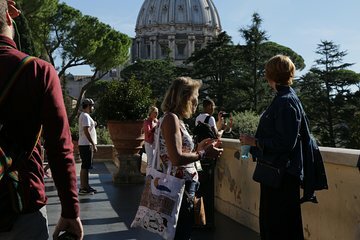 Skip the line and get exclusive access on a 3-hour, small-group tour of the Vatican with an expert guide. Enjoy unobstructed views as you explore the complex free of crowds and noise. See the Vatican Museum's most important works as you visit galleries and art collections, then step into the Sistine Chapel to take in the exquisite paintings on the vaulted ceiling. Follow a special passage into St. Peter’s Basilica, and discover the secrets and sacred places of the world’s largest church. Small group tour was great! Out guide Gulio was very knowledgeable and passionate about the information he presented. Easy to find the group and tour was wonderful! Informative, well organized tour. Our guide, Julia, was knowledgeable, spoke English very well and it was obvious she enjoyed giving this tour and presenting the story of the history and art of the Vatican. This would not have been as pleasant a memory if we had waited in the long lines and rented a headset! Excellent way to see the highlights of the Vatican. There are so many amazing things to digest it was very helpful having a knowledgeable guide to point out the highlights. The Vatican is always packed but early morning makes the crowds much more manageable and enjoyable. We only had 8 people in the tour which was fantastic. Highly recommend. Received so much info while waiting in line for the Vatican to open for the early entry. If you anticipate entering the Sistine Chapel with fewer people in it you may be disappointed. Still a wonderful guide Ressella ? (Scarlet) made for a very enjoyable morning. So much wealth and opulence?? Claudia took us into the Vatican and gave us so much information! You can tell she is passionate about this place and wanted to make sure that we were also. The small group was amazing, and the fact that we were in the Sistine Chapel with only a few other people was once in a lifetime. I would highly recommend this tour. Excellent tour guide, Fe who sure knows every little fact about the Vatican! it was all so magnificent and we treasured every minute being there and learning so much from Fe. Great way to see the vatican museum, Sistine chapel and St Peters early before it gets so busy. It would have been a five but lots of problems with the mice and headphones not working well. Some people didn't follow meeting instructions and we had to wait/find them before proceeding. Excellent tour. As advertised it is indeed semi private as a number of other tour companies do go in early, but it certainly avoids the massive queues that can develop. The tour guide, Felicity, was very knowledgeable and the tour was a good three hours, in both the Vatican museum and St Peter's Basilica. Well worth it. There at the end of July 2017. Early in AM but still too crowded, which of course is not the Tour's fault. But the impression is you're just another head of cattle in the herd they want to rush through as quickly as possible, making room for their next group. The ear phones all these tours to use are worthless. Combine that with the good but italian-accented English the guide speaks, you pick up maybe 45 of what is being said. The only thing good about the tour is you didn't have to wait in line, but that's about it.